With the climate talks now monopolized by senior political officials, and NGOs essentially excluded from the process of consultation, we decided to hit the streets of Copenhagen to gauge the reactions of ordinary Danes to the do or die event happening in their midst. But on a bitterly cold and damp winter day, the prospect of staying outside for more than a few minutes was simply too unappealing. The result? Talk to people working in the various stores lining the main route from our flat to the central train station about their thoughts on climate change, COP15 and the violent reactions of police to recent protests, particularly yesterday’s melee at the Bella Centre where the official meetings are taking place. If the local retail sector is anything to go by, the heavy-handed police tactics seem to be accepted as both inevitable and unavoidable, particularly against those who are seen as “trouble-making outsiders,” as one merchant put it. As for the conference, those we spoke to saw it chiefly as an inconvenience at best, and disruptive at worst. Business has been bad because of the global recession, but at this time of year there should at least be a faint hope of an uptick in sales as people warmed to the season of gift giving. “Why not hold it in January, after the Christmas season when we hope to do significant business,” said the owner of a local flower shop, a man in his late-30s. “My customers are scared and not spending any money. This conference has been a nightmare for my sales,” exclaimed another. “All I care about is paying for my electricity, paying my staff their salary, and providing for my kids. I have no time to think of anything else,” stated a third. And the issue of climate change itself? Danes have an international reputation for being easy-going, compassionate, tolerant, and (most environmentally telling of all) bicycle loving. 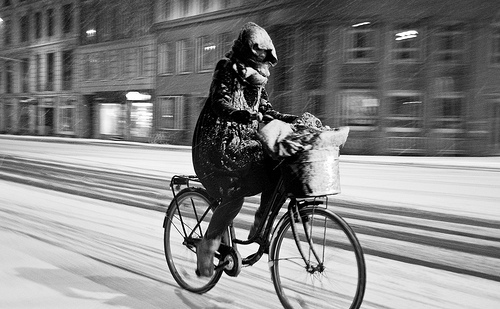 Even in sub zero temperatures with a generous coating of snow on the ground, Copenhagen is full of cyclists riding to work, to shop, and to school. As for concern about the impacts of climate change on the developing world (a dominant theme of the talks)? It barely registered on the radar. For us this was both surprising and disquieting, but it was a consistent thread in the discussions nevertheless. When Napoleon Bonaparte dismissed the English as a nation of shopkeepers, he meant to suggest that because they were fixated on short term financial gain, they would not offer much resistance when push came to shove. But as he learned to his regret, shopkeepers can be highly resistant. Although we are careful to avoid generalizing from these discussions to the broader population, there’s a potential lesson to be learned for the climate change movement and their supporters in the political class: it is important to continue making the case that climate change is fundamentally a moral and social justice issue that has far-reaching and dangerous consequences, particularly for vulnerable people in the developing world. However, it is also crucial to pay attention to the concerns, economic or otherwise, of ordinary citizens in those countries that will bear the lion’s share of the financial cost of fixing a problem that they may well only be partially responsible for creating. The longer climate change is treated as an either/or issue, the longer it will take to mobilize the domestic support in those countries that have the power and ability to make a difference. 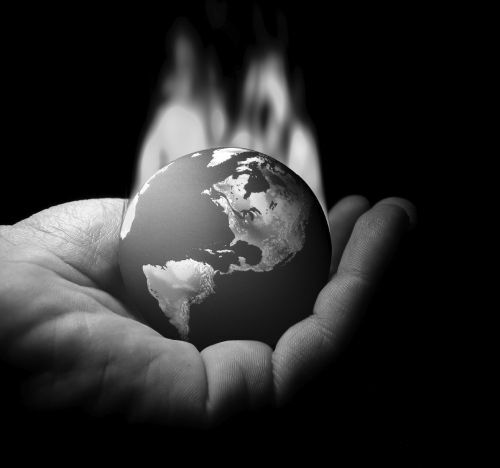 Climategate: A crisis of science or communication? The past few weeks have offered a cornucopia of scandals: allegations of Canada’s complicity in the torture of Afghans; the arrest of top officials at the Toronto Humane Society on charges of animal cruelty; Tiger Woods’s run-in with a fire hydrant at the end of his own driveway. This was the story about how an unidentified computer hacker stole upwards of 4,000 documents from the Climatic Research Unit (CRU) at the University of East Anglia in the UK, the world’s leading scientific authority on global warming. These illegally obtained materials consisted mostly of personal email correspondence between CRU scientists and their international collaborators. They were first posted to a Russian web server and quickly circulated around the world. In very little time critics of the CRU seized upon the documents, claiming they offer unambiguous “proof“ of a vast conspiracy by the climate science establishment, which, if you believe the skeptics, had apparently been working in consort with the UN, George Soros, environmental NGOs, Al Gore, the “left wing” media, Hollywood, and several thousand climate scientists around the world to execute an elaborately conceived carbon-based tax grab. “An Inconvenient Hoax,” reported the Examiner.com. “The skeptics are vindicated,” opined one conservative Canadian columnist. “Botch after botch after botch,” said another. Not surprisingly “Climategate” has become the focus of countless news columns, op-eds, letters-to-the-editor, and several radio call-in shows. It’s been a hot topic on Twitter; it provided grist for The Daily Show; and there is even a Facebook Fan Page. I want to suggest that “Climategate” is important not just because it sheds light on the politicization of climate science. It is important because it brings the human and normative elements of science front and centre and illustrates the central role of communication in scientific debates. Pierre Bourdieu famously wrote that “scandal, in the form of revelation by the [media] of an ethical transgression by an eminent personality, underlines the rule of devotion to the general interest, in other words, disinterestedness, which is required of all individuals designated to be the official incarnation of the group.” For Bourdieu, a scandal was a breach of expectation: just as we expect our law enforcement officials to police fairly, and our physicians to “do no harm,” we expect scientists to operate independently of the social world. The problem, however, is that scientific facts can never be fully divorced from their social and political contexts. The key question we must confront, therefore, is whether the context for climate change research has become so overtly politicized that it has damaged the way scientists interact—with the media, the public, and each other. With this problem in mind, it is worth reflecting, as my colleague Chris Russill has done, on the work of climatologist Steven Schneider, who argued that climate scientists have been forced into a “double ethical bind.” Schneider believes that the image we have of science as an overly technical endeavour compromises its potential to mobilize necessary political and public actions. He argues that scientists ought to make an impact on the world outside of their labs, especially when their research deals with issue of human and planetary survival. Yet to do so, they must not only be excellent researchers—they must also be convincing communicators. The problem with this recommendation is that the world of public communication demands a very different set of core competencies from the world of climate science: effective oratory skills, an ability to make a persuasive case with image and metaphor, an intuitive sense about how to drive the media agenda by mastering the machinations of its ecology. These are not skills easily acquired and can place enormous pressure onto scientists, particularly when their research is under constant political scrutiny and sits in the crosshairs of a well funded and relentless contrarian movement that has taken aggressively to the airwaves, that appears to be influencing the screening agendas of the film festival circuit, and which continues to burn up the blogosphere. In the face of what must be monumental institutional pressure, CRU director Phil Jones was forced to step down from his post pending the outcome of a university investigation. Michael Mann, the Penn State University paleoclimatologist famous for originating the infamous “hockey stick graph” is reportedly also under investigation by his employer. Their international colleagues, for the most part, have gone silent. Supportive journalists, bloggers, environmental activists, political figures, and others with a stake in the issue are in damage control mode, forced into playing defense yet continuing to press the case that the overwhelming majority of scientists, policy-makers, and almost every government in the world acknowledges the probability that the planet is warming and will continue to do so because of human activity, and that it is our moral, economic, and political imperative to do so something about it now. Ultimately, the CRU is not facing a crisis of science, but a crisis of communication. Such communicative “stumbling” has, seemingly, provided a new opportunity to the global warming skeptics to advance their central message, that the science is junk because the scientists can’t be trusted. Importantly, this does not mean that the skeptics’ frame is empirically adequate. It simply means that the interpretive labour involved in reconciling the gap between this message and our mediated experiences has been reduced. Given the high stakes of the Copenhagen talks beginning next week, and the importance of achieving an international agreement, this is a crisis that will be resolved only through a sincere explanation of what happened and a promise to never let it happen again. Until this occurs, the strength of the scientific argument for anthropogenic global warming will continue to come under attack. Corporate Responsibility or Gratuitous Greenwashing? Let the countdown begin: it’s 3 days to the grand opening of the new California Academy of Sciences museum, a state of the art spectacle of architecture and sustainability. It’s truly an impressive achievement. Visit the website and you’ll see for yourself: a 2.5 acre “living roof” that’s home to 1.7 million native plants; insulation made from recycled denim; and a solar canopy containing 60,000 voltaic photo cells. These are just a few highlights. The main exhibit, “Altered State: Climate Change in California,” takes up the majority of the museum’s main floor and includes numerous interactive displays, such as the bones of both an endangered blue whale and a T-Rex. But alas, not is all well in the world of popular science education. In the build-up to the event, the Academy has been trumpeting the architectural and scientific achievements of the new building and feature exhibits. For environmentalists, however, it’s a program underwritten by a patron with questionable intentions. It seems that “when visitors show up for the opening weekend’s festivities, they’ll be told they have Pacific Gas and Electric Co. to thank for the museum’s opening, which includes free admission on the first day.” According to the media release posted on the utility’s website, “[e]mpowering Californians with the tools and information to reduce their impact on climate change is critical to protecting California’s natural heritage. We’re honored by the opportunity to support the California Academy of Sciences as they take on the important mission of inspiring future leaders to create a more sustainable California.” Sounds like an act of nobility and corporate virtue. The news item advises that PG&E invested $1.5 million for the rights to co-sponsor, benefiting in return with post plenty of corporate signage, prominent mention in academy press releases, subtle plugs to journalists by museum staffers, and a spot on the five-person panel of academy leaders that addressed the assembled scribes at the pre-opening media tour. These kinds of public-private partnerships in the arts are not new, as the cultural historian Neil Harris argues in his 1990 book Cultural Excursions: Marketing Appetites and Cultural Tastes in Modern America. Harris claims “the search for an enlightened American art patronage is as old as the republic itself,” and shows several instances where art and corporate power intersect. He also has a fascinating chapter on the link between museums and issue advocacy, which would no doubt fit in relation to the global warming education initiative involved here. The point is that big business has long lined up behind the arts and for various reasons — some of them noble and benevolent, and others quite deliberately self-serving. For the activist group Green Guerillas Against Greenwashing, PG&E falls squarely into the latter category. Noting the utility company’s ongoing efforts to block current legislation (The Clean Energy Act) and its legacy of lobbying against high environmental standards for utilities companies, the group finds the organization’s sudden support for public education about global warming a little too hot to handle. For PG&E and proponents of corporate social responsibility, the utility company’s sponsorship of this initiative demonstrates not an attempt to deceive or manipulate, but to link science and climate change education and to show that there are times when industry can mobilize its significant capital advantages to demonstrate environmental leadership.